In previous recommendations (The Naked City, He Walked by Night), I highlighted the rising popularity of police procedurals after the war. Recognizing that post-war audiences were gripped by more realistic, torn from the headlines crime stories, Hollywood producers were giddy over the Kefauver Committee’s investigation of organized crime. Many Americans were transfixed by the hearings, both because they provided their first glimpse into the workings of the Mafia and because they were on this new fangled gizmo known as a television. A raft of films followed that were based on the hearings either directly or obliquely (the latter including my first ever weekend film recommendation, Bullitt). Many of the Kefauver films were cheap and unimaginative, but this week’s recommendation is one of the best: 1952’s The Turning Point. The strong cast features Edmond O’Brien as John Conroy, a special prosecutor appointed to take down a criminal syndicate run by the slimy, brutal Neil Eichelberger (Ed Begley), who poses as a legitimate businessman (O’Brien was last with us in prior recommendation The Web). 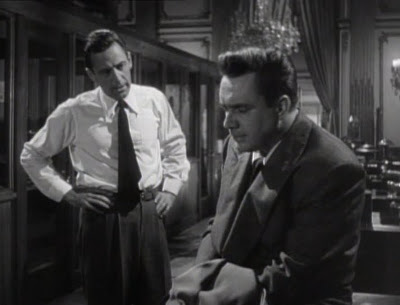 Conroy’s hard-nosed childhood pal (William Holden), now a crime reporter, comes along for the ride, not because he believes anything will come of the investigation but because he admires his old friend and also, rather guiltily, has eyes for Conroy’s gorgeous, idealistic assistant (Alexis Smith). Meanwhile, John’s father, a beat cop played by reliable veteran character actor Tom Tully, is also in the mix, but what side he’s playing is a subject of mystery. Warren Duff never became famous as a screenwriter, but he was very good in his niche of tough crime stories. He does a particularly admirable job here creating dramatic face off scenes between each pair of principals. Lionel Lindon’s skilled camerawork makes the film pleasing to the eye (love the long tracking shot with Holden and O’Brien early on) as does William Holden, who looks fabulous in a series of tailored suits that the legendary Edith Head picked for him (I guess ink-stained wretches could afford those kind of threads and fashion advice back then). 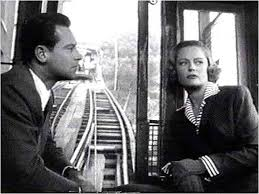 The broad-shouldered screen icon has real chemistry with his equally toothsome co-star Alexis Smith, who puts spine and depth into her character rather than just being eye candy. She and Duff’s script are particularly good at ripping apart the cynical facade of Holden’s character, which is potent stuff for Holden fans given how often he played this type. The Turning Point has a few weaknesses. After a gripping first 45 minutes there is a lull in the action at the actual commission hearings, which should have been a highlight of the film, especially with a skilled actor like Ed Begley at center stage. There are also a couple small logical holes and overly worn elements in the plot. As a result, I would not call The Turning Point an all-time classic crime melodrama. But it’s definitely exciting and entertaining, with a cast that is aces right down the line. As of this writing, The Turning Point is available for free to Amazon Prime subscribers – just don’t mix it up with the 1977 movie about ballet dancers. p.s. Plug ugly Neville Brand, who made a career out of playing nasty thugs, appears at the end as a hired killer. Both he and O’Brien will be with us again next week so stay tuned. p.p.s. Interested in a different sort of film? Check out this list of prior recommendations. The 1977 film about female friendship and ambition is also fine (Anne Bancroft and Shirley Maclaine).